FBI Agent Bill Evanina, an Obama administration holdover and head of the National Counterintelligence and Security Center, a DNI unit, has been awaiting Senate confirmation for two years. Earlier this month, Sen. Chuck Grassley, former chairman of the Senate Judiciary Committee, placed a hold on Evanina's nomination for the second time to prevent him from being the first Senate-confirmed director of the counterintelligence center. The hold is based on a dispute with the office of the Director of National Intelligence (DNI) and Justice Department. It is the second time in two years the nomination has been blocked by Grassley who is investigating Russian meddling in the 2016 election. The last hold on the nominee took place in June 2018. "I continue to experience difficulties obtaining relevant documents and briefings from the Justice Department and the Office of the Director of National Intelligence related to 2016 election controversies," Grassley said in placing the hold March 5. The block on the nomination is not based on questioning Evanina's credentials, Grassley noted. However, Evanina recently raised concerns for stating that the arrest, imprisonment, or execution of scores of U.S. intelligence informants in China and Iran were a minor setback for American intelligence agencies. "Counterintelligence efforts, like any intelligence discipline, suffer occasional setbacks, and we learn from these setbacks," Evanina told the Wall Street Journal. The losses are among the most damaging human spying failures that cost lives and will make it more difficult for intelligence officers to recruit similar assets in the future. The U.S. government has been keeping details about the disasters secret. Brief mention has been made in two court cases. Evanina was responding to an earlier opinion article by this reporter in the Journal that was critical of the American counterintelligence system for causing the loss of recruited agents that were linked to former Air Force counterintelligence agent Monica Witt, who defected to Iran in 2013. Witt was indicted Feb. 8—more than five years after fleeing to Iran—and charged with compromising a program used to communicate secretly with recruited agents in Iran and the Middle East. In May 2011, Iran's Intelligence Ministry announced the arrest of 42 people allegedly for spying for the CIA. U.S. officials believe the rolling up of the CIA network in Iran and other locations is related to Witt's treachery. A year earlier in 2010, the CIA suffered one of the most serious intelligence failures in the agency's history. That lapse resulted in as many as 30 CIA informants being arrested in China. Several of the spies were executed, including one Chinese security official shot in the courtyard of a government building. Evanina was named to the post in 2014 by then-DNI James Clapper, the intelligence director under former President Barack Obama who since leaving office has revealed his strong partisan and anti-Trump views. Evanina was the government's most senior counterintelligence official during Russia's hack and release influence operation aimed at undermining the 2016 presidential election. Asked during a public appearance in April 2018 why no action was taken to stop the Russian intelligence activities in 2016, Evanina said counterintelligence agencies worked against the Russians but the lack of any response was "a policy decision." "And that's the world that I don't live in," he said. Evanina said he believes counterintelligence personnel are restricted to informing policymakers about foreign intelligence activities but are not involved in the decision-making regarding the activities. Former CIA Director John Brennan has said Moscow's hacking operations by Russian intelligence agencies targeting the elections were known by the end of 2015 and were clear by the summer of 2016. Yet the only response taken prior to November was a telephone call by Brennan complaining to the head of Russia's FSB spy agency, and a request to Russian President Vladimir Putin from Obama to halt the election meddling. "We have to separate counterintelligence activity from policy—two separate things,." Evanina said. That response differs from his written answers to the Senate Intelligence Committee in 2018, Evanina stated that he believed he was qualified to head the counterintelligence center because of his record of providing "strategic guidance and policy to over 100 departments and agencies." The legislation creating his center states that he would serve as chairman of the National Counterintelligence Policy Board, a major policy position. Evanina also incorrectly stated in his letter to the editor that under the Trump administration counterintelligence was made a "primary strategy and mission objective" in the new National Intelligence Strategy. However, the strategy lists counterintelligence and security as the last of seven strategic priorities. Evanina, in attempting to defend U.S. counterspies in his letter to the newspaper, made no comment on the large-scale losses by American intelligence agencies regarding the agents imprisoned or killed. Instead, he sought to minimize the losses of at least 72 foreign nationals who risked their lives to provide secrets to the U.S. government as intermittent and that problems associated with the failures had been fixed. Contrary to that assertion, U.S. intelligence agencies experienced serious counterintelligence failures for more than 30 years involving penetrations of nearly every U.S. intelligence agency by hostile intelligence services. The continued losses indicate serious problems exist within the American counterintelligence community—the intelligence branch in charge of preventing foreign intelligence services from learning secrets about recruited agents and other intelligence matters. Evanina spokesman Dean Boyd repeatedly declined to explain what the counterintelligence nominee meant by the "occasional losses." "Director Evanina stands by his letter defending the men and women of the U.S. counterintelligence community who work day and night to protect our nation from foreign intelligence threats," Boyd said. Evanina has been in charge of the counterspy center since 2014 when the center was downgraded from the original entity known as the National Counterintelligence Executive. The shift made the center focus less on counterintelligence and more on the security function—targeting so-called insider threats like the loss of secrets caused by former Army Sgt. Bradley Manning and former NSA contractor Edward Snowden. As a result of the downgrading, U.S. intelligence agencies have lacked sufficient counterintelligence strategy and operations and have been struck by the large-scale agent losses and other failures. Regarding the China compromises, the CIA, the intelligence community's lead agency for human intelligence gathering, lost an estimated 30 recruited agents beginning in 2010. The failure resulted in the loss of access to intelligence on China—now regarded by the Trump administration as the most serious national security threat to the United States. Intelligence officials said the agent losses in China were the result of either a traitor inside the agency, or the compromise by Chinese intelligence of a secret Internet-based system used by CIA case officers to communicate with agents. Federal authorities arrested former CIA officer Jerry Chun Shing Lee on Jan. 15, 2018, and charged him with illegally holding classified CIA information—specifically the names and identities of recruited CIA agents in China found in a notebook he was holding. Like Witt, the FBI waited more than five years before arresting Lee despite having him under surveillance. Other counterintelligence officials believed the Chinese agents were uncovered as a result of a combination of failures—both human and technical. Analysts have traced the larger inability to engage in aggressive counterintelligence to the late CIA master counterspy, James Jesus Angleton, who zealously pursued Soviet penetration agents in CIA in what his critics said disrupted regular CIA spying operations. Angleton was the last chief of the CIA's Counterintelligence Staff that operated largely independent of the directorate of operations and thus could provide a valuable security check on the recruitment of double agents or could prevent foreign intelligence penetrations of CIA. He was forced to retire in 1975 in a dispute with then-CIA Director William Colby after a domestic spying program was leaked to the press. In the aftermath of his departure, counterintelligence was downgraded by CIA and dismissed by critics as "sick think" because it questioned the loyalty of many serving intelligence officials. Many analysts believe the backlash is at the root of the disasters that began in the 1980s. John Walker-Jerry Whitworth spy ring provided secrets to Moscow between the 1960s until 1985. The FBI ignored warnings from his wife he was a spy for over a year. Officials said the secret Navy codes given to Moscow would have helped win a war against the United States. Aldrich Ames, a drunken CIA counterintelligence official, walked into the Soviet embassy in Washington and began spying in 1985. He provided Moscow with information on all recruited CIA agents, most of whom were imprisoned or killed. Robert Hanssen, a turncoat FBI agent, spied for the Soviet Union in 1985 simultaneously with Ames. He continued giving secrets to Russia until his arrest in 2001. FBI agents failed to uncover his spying and instead hounded an innocent CIA officer for nearly three years before finally arresting Hanssen. The CIA was fooled by East European communist intelligence services during the Cold War that used more than 100 double agents to feed false information to U.S. intelligence. The lapse was a described as a "massive" intelligence failure. In Cuba, communist authorities used 27 double agents to fool the CIA for years until the deception was revealed by a Cuban defector. Ana Montes, a Cuban spy working for the Defense Intelligence Agency, revealed to Havana at least four U.S. spies in Cuba and also betrayed U.S. special operations forces at a base in Central America during the 1980s that was attacked by Cuban-backed rebels. During the 1990s, Los Alamos nuclear weapons official Wen Ho Lee provided nuclear secrets to China. The FBI mishandled the case and knew about Lee's activities with China in 1982 but did not investigate him until 1998. He would be charged with mishandling nuclear secrets. China, however, obtained secrets on every deployed warhead in the U.S. nuclear arsenal. Katrina Leung, a Los Angeles businesswoman, worked as an FBI informant for many years until it was discovered she was a double agent working for China. The FBI mishandled the investigation as they discovered Leung was having affairs with both her FBI agent handler and his boss. Army Sgt. Bradley Manning stole some 250,000 classified documents and provided them to the anti-secrecy website WikiLeaks. The documents revealed the identifies of foreigners working with U.S. intelligence and placed their lives at risk. NSA contractor Edward Snowden stole up to 1.7 million NSA documents and compromised extremely sensitive electronic spying operations before fleeing to Moscow. The compromise came despite NSA warning other spy agencies to be alert for treacherous insiders. Current FBI Assistant Director for Counterintelligence William Priestap ignored the extra-marital affair between senior FBI counterspy Peter Strzok and Lisa Page, a serious counterintelligence lapse that made Strzok, the anti-Trump FBI agent, vulnerable to blackmail. Strzok, who was fired for anti-Trump text messages, was asked by his mistress in an Aug. 8, 2016 text message whether Trump would ever become president and replied, "No. No he’s not. We’ll stop it"—suggesting he would use his position as a senior counterintelligence official to prevent Trump's election. The FBI inspector general stated that the threat was "antithetical to the core values of the FBI and the Department of Justice." 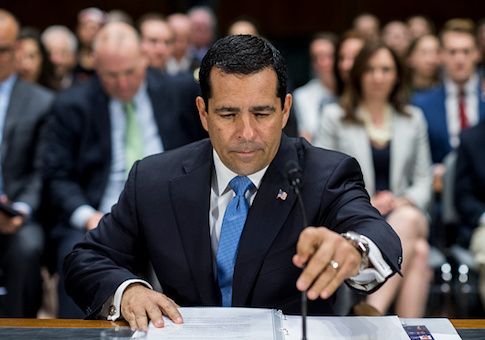 Evanina was appointed to head the counterintelligence center before Congress recently passed legislation requiring the director to be a presidential appointee confirmed by the Senate. He has continued in the position as an unconfirmed appointee. His nomination expired at the end of December and he was re-nominated in January. The Senate Select Committee on Intelligence voted to approve his nomination Feb. 28. Senate Intelligence Committee Chairman Sen. Richard Burr (R., N.C.) praised Evanina after the committee vote. "Over the years, he has proven time and again he has the real-world experience and professionalism our country needs to navigate increasingly complex threats to both the public and private sectors," Burr said, adding that Congress highlighted the importance of counterintelligence by requiring the director of the center to be Senate confirmed. Grassley said in announcing the hold that Deputy Attorney General Rod Rosenstein had personally assured him the Senate Judiciary Committee would receive equal access to information provided to the House Permanent Select Committee on Intelligence. The information is related to concessions made by Justice during negotiations regarding subpoenas from the House committee. "However, I and the Judiciary Committee have not received equal access," Grassley said. In particular, last August Grassley wrote to the Justice Department seeking documents sent to the House on former Justice official Bruce Ohr, a key player involved in the Democrat-funded anti-Trump political operation against candidate Donald Trump. The unverified dossier by former British intelligence officer Christopher Steele helped trigger investigations into Trump associates. "I have since learned that the Justice Department has taken the position that Director [of National Intelligence Dan] Coats has prohibited them from sharing the requested records with the committee," the senator said. Also, Grassley complained that in addition to the document request, the DNI and Justice Department in May provided a briefing in relation to a House intelligence committee subpoena and excluded Senate Judiciary Committee staff. "Thus far, the committee's attempts to schedule an equivalent briefing have been ignored," he said. "The administration's continued, ongoing, and blatant lack of cooperation has forced my hand. I must object to any consideration of this nomination." Fred Fleitz, a former CIA officer, questioned Evanina’s judgement. "So not only is Evanina in denial about the seriousness of these huge security breaches, he referred to an article by an American journalst well known as a leading expert in intelligence issues as ‘uninformed,’" Fleitz said. "What is going in U.S. counterintelligence?" Ken deGraffenreid, deputy national counterintelligence executive during the George W. Bush administration, said U.S. intelligence has suffered "a continuous series of damaging losses of our most vital and closely guarded national security secrets to foreign intelligence activities" since World War to to the present. Counterintelligence and security shortcomings were examined by dozens of both official and outside groups that produced scores of recommendations for improvement and reform. "However, because of intense and sustained bureaucratic resistance from CIA and FBI,during these seventy-five years, few of these reforms have ever been implemented, despite the urgent need to do so," deGraffenreid said. "Until our counterintelligence is dramatically reformed our vital secrets will continue to be open to theft, exploitation, and manipulation."